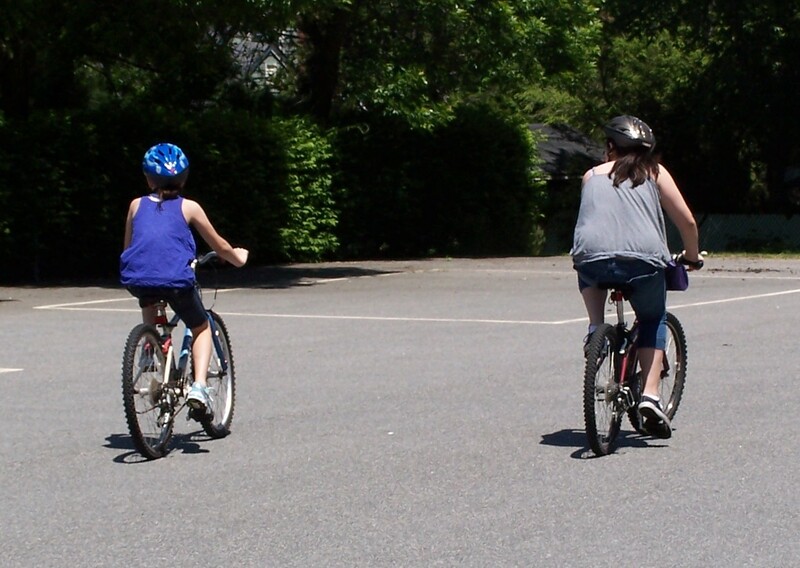 Bike riding is just one of the fun, free summer activities you can do with your kids! We are at the point of counting the number of school days until school is out (14 left after today). I can’t wait. I love summer, my whole family loves summer. We don’t usually make any big plans for the summer, but yet somehow we do a lot and the summer always goes by much too fast. Since I’m at the point where I’m thinking ahead to summer activities, I’m guessing that I’m not the only one. I thought that today I’d share a list of fun, free summer activities that we do. Most everything is something you can do with your kids also, no matter where you live. But I’d like to ask you, what kinds of other fun, free things do you do over the summer with your kids? Be sure to leave a comment and add to my list! 1) Riding bikes: There are several local bike paths that we can take advantage of, and we also use a lot of the big, open school parking lots for wide open biking riding opportunities too. 2) Free bowling: AMF has free bowling EVERY DAY all summer long, two games per kid, not counting shoe rental. You can click on the link to sign up your kids! It’s great for hot days, because it’s nice and cool inside, and it’s great for rainy days, as it gets them out of the house for a bit. 3) Free movies: Regal Cinemas has free movies all summer, as does Showcase Cinemas, once a week. Other movie theaters may be doing the same sort of thing near you too! 4) State Parks: Many state parks all over the country have free entry days or special event days that are free. Check out this link to find one near you! 5) Museums: Many museums are free on Fridays or have free events on Fridays. Check out the calendars for museums near you to see if they do Free Museum Fridays or something similar. 6) Free Summer Music Concerts: Near us, you can go to a free outdoor music concert almost every night of the week. Local bands in our area play in various cities and towns throughout our state and it’s a great night out with the family to sit outside and hear them play. They are also usually all different sorts of bands from oldies to calypso to swing. It’s great fun for the kids to hear something different and it gives them quite the repertoire of music appreciation. 7) Dinner on the beach: Many of the beaches near us are not free during the day but are free at night. Beach passes here are quite expensive, so instead, we’ll often plan a picnic on the beach and bring our dinner down there. We swim and play from early evening until sunset. There’s nothing better, in my opinion, than watching my kids play in the waves as the sun is going down. And to me, it’s often even more special and memorable than a regular day at the beach, although we enjoy that too. 8) Visit your local library: We love our local libraries. I can’t say it enough. A regular visit to the library is one way for us to spend an hour or more in a cool, calm place. But our libraries really kick it up for the summer. We can go to any of their branches to see local performers, participate in a craft, or to participate in their summer reading programs. Be sure to check out your local libraries to see what they offer for summer activities. 9) Letterboxing: My family loves letterboxing and we spend some time in the warmer months finding local letterboxes. If you have never done it before, give it a try! If you click on the link you can read one of my older posts about it. 10) Hiking: Sometimes just taking a nice afternoon hike is all you need to wind down your day. Many local trails are nice and shady, so you can keep cool while you get some exercise with the kids. You may see some wildlife along the way, and don’t forget your bug spray! So tell me….what can you add to this list? Leave a comment and tell me what fun things you do with your family in the summertime!